Sawan is the fifth month in the Hindu calendar. Sawan is also known by the name Shravana. It is a month which is dedicated to the veneration of Lord Shiva, who is also known by the name Mahadeva, Maheshwar, Neelkanth,Rudra, Naresh, Shankar, etc. Sawan is one of the most awaited months of the Hindu calendar, as the devotees of Lord Shiva wait for this pious month all the year round, in order to pay their devotion to Lord Shiva. A number of devotees travel to Haridwar, Devghar, and various other sacred places on their foot, carrying Kanvar on their shoulders.There are different festivals that are celebrated in the holy month of Savan. Along with this, Savan is a month that is celebrated by the people with joy, as the month of Shravan welcomes monsoon, providing relief from the scorching heat of summer. A number of festivals are celebrated during this holy month. As we know, India is a land of diversity, the festivals of sawan differ in the northern and southern regions of the country. Kanvar Yatra, also known as Kanwar Mela is a holy fair that starts in the sacred month of Shravana (Savan). Devotees of Lord Shiva travel barefooted to Har ki Pauri in Haridwar, Gangotri in Uttarakhand, and various other places to obtain the holy water of the sacred river Ganga, and offer it to Lord Shiva. The devotees who participate in this annual pilgrimage (Kanwar Mela) are known as Kanwariyas. The legend behind Kanvar Mela dates back to the day when the churning of ocean (Samudra Manthan) was taking place. Along with several other things, a deadly poison was also obtained as a product. To save the world from the poison, Mahadeva inhaled all of it, and as a result, his throat turned blue. This is the reason why he is also known by the name Neelkanth. It is believed that Ravana, being a devout follower of Lord Shiva, brought Gangajal with the help of a Kanvar (a single pole at the ends of which loads are fastened), and poured it over Shiva Lingam. This ultimately set Lord Shiva free of the negativity of the poison he inhaled. ● Savan Somvar Vrat : The fast observed on Mondays during the month of Sawan is known is as Savan Somvar. ● Solah Somvar Vrat : The 16 fasts which are observed on 16 consecutive Mondays are termed as Solah Somvar Vrats. ● Pradosh Vrat : Pradosh Vrat is a fast which is observed till Pradosh Kaal in honour of Lord Shiva and Goddess Parvati to seek their divine blessings. ● The one who is observing the fast, should wake up early in the morning, and take a bath to eliminate any kind of impurity from their body. ● Milk should be offered to Shiva Lingam in any Shiva Temple. ● An altar should be set up, and the Puja Sthal should be cleaned properly to worship Mahadeva. ● By all heart and dedication, the observers of the fast should take an oath to immerse themselves in the devotion of Mahadeva during the fast. ● Prayers to Lord Shiva are offered twice a day. The first puja should be done early in the morning, while the second one should be done after the Sunset. ● For the puja, a lamp with gingelly oil is lighted up, and flowers are offered to Lord Shiva. ● Mantras are chanted, and nuts, Panchamrit, coconut, betel leaves, etc. are offered to Mahadeva. ● Solah Somvar Vrat Katha (Sawan Vrat Katha) is an important facet of Sawan, and is to be recited during the Vrat. The Vrat Katha describes the life of Mahadeva. ● As soon as the Puja is over, Prasad is distributed among the family members. ● After the evening Puja, the fast can be broken, and normal food can be consumed. Any Shiva Mantra including Om Namah Shivay can be chanted during Sawan. Who observes the Vrat (Sawan Somvar Vrat)? The Vrat is observed by married women for a happy and blissful married life. Unmarried woman also observe this fast to get blessed with a good husband and have a joyous married life. It is believed that anyone who observes the fast with unswerving faith and devotion, blessed by Mahadeva himself. Like every festival of the Hindu religion, there is a story behind Sawan Vrat also. It is believed that once upon a time, there lived a man who was very rich, and spent a life of luxury. He had all sorts of comforts, but the absence of a child was the only reason for tension and stress in his life. The man and his wife were devotees of Lord Shiva, and used to fast on Mondays to please Lord Shiva. Observing their unfaltering devotion, Goddess Parvati insisted Mahadeva to bless them with a child. As a result, they were finally able to have a healthy son. The son was named Amar, but along with his birth, came the prophesy that the child would die at the age of 12 years. As the child grew up, he was sent to Kashi for his education. He was accompanied by his maternal uncle, and was told by his parents to perform Yagya and charity wherever he goes. On the way, they came across the wedding ceremony of a princess, whose groom-to-be was half-sighted. The family of the groom was afraid that the secret of their son’s half blindness may be discovered. They requested Amar to take the place of the groom, to which he agreed. He got married to the princess, but did not want to betray her. He chose to write the truth on the wedding stole (chunri) of his bride. When the bride read his message, she waited for her original husband and did not leave her parent’s house. Amar continued his journey, and left for Kashi. During all this time, Amar adhered to the words of his parents, and performed religious deeds. The day he turned 12, he sat in a Shiva temple, and continued offering Bel patra (Bilva leaves) to Lord Shiva. When Lord Yama came to take away the live of the boy, Lord Shiva chose to bless the child with the boon of a long life, and as a result, Amar did not die and Yamaraj returned empty-handed. Amar, blessed by Mahadeva himself, returned home with his bride, and the unshakeable dedication of their family for Mahadeva proved that Lord Shiva is always there for his true devotees to help them out, and bestow upon them his divine blessings. 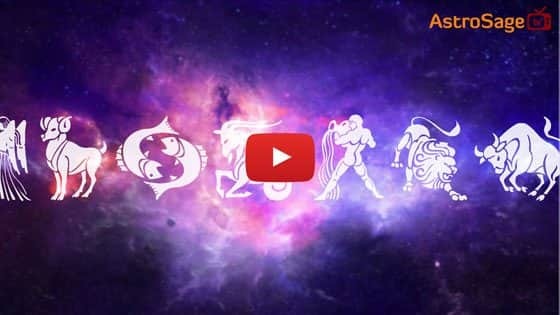 It is believed that with the beginning of Sawan, the Sun enters the Zodiac Sign Leo, which has different impacts on all 12 Zodiac Signs. We, here at AstroSage, hope that all the choicest blessings of Mahadeva are bestowed upon you!